Finishing * WoodGrid® Coffered Ceilings by Midwestern Wood Products Co. Finish: We offer an optional custom cabinet-grade finish to match the color of your choice. Our standard wood species are Poplar, Red Oak, Knotty Pine, Ash, Soft Maple, Cherry and Walnut. 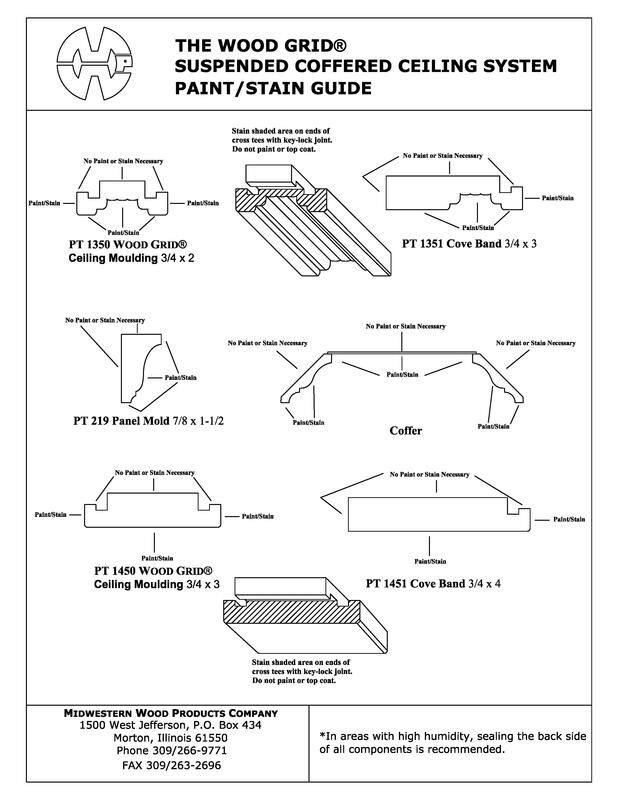 We also offer custom coffered ceilings in other domestic and imported hardwoods. Poplar is the least expensive wood we offer, and it can be painted or stained. It stains beautifully in medium to dark cherry, walnut or mahogany colors. Our standard finish includes a cabinet-grade stain and conversion varnish satin finish. Painting is also available in a standard white. We offer specialty finishing techniques such as distressing, glazing, dye stains, high gloss and fire-retardant finishes, which are available at additional cost.